… Or, How to Procrastinate Productively. I decided to make one of my current projects open source and post them on Google Code just for fun. The project is a tool chain that I’m using to remake Thrust. 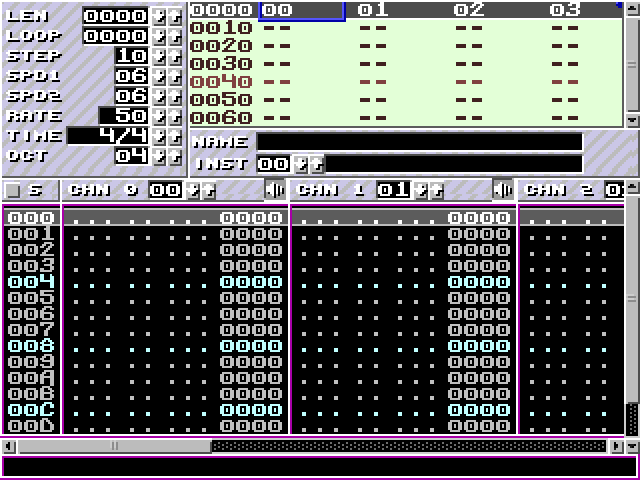 In reality, I decided to divide the project into two separate projects: the actual game engine (called klystron) and related tools, and a music editor that uses the engine. 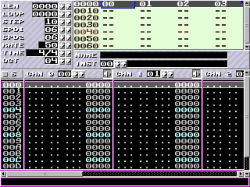 The sound engine (“Cyd”) is basically a very simple software synthesizer with capabilities comparable to the SID or any 8-bit machine from the 80s. The editor is a fairly standard tracker, much like GoatTracker. The graphics half of the engine is basically a wrapper around a quite fast collision detection system (pixel-accurate, or it wouldn’t be much good for a thrustlike) built on SDL. It also does background collisions and drawing as well. As you may have guessed, the whole point is to provide a limited but still helpful set of routines that are useful for creating 2D games not unlike what video games were in 1991. A note on Google Code: it’s rather nice. It provides the standard open source development stuff like source control an such but I really like how clean and hassle-free it is. Adding a project takes a minute and after that it’s simply coding and some quick documentation on the project wiki. The project wiki is good example of how simple but elegant the system is: the wiki pages actually exists inside the source control as files, just like your source code. I came up with a neat way to retarget images using a mesh that is transformed by rotating and doing an ortographic (non-perspective) projection. This is generally quite interesting since it can be done using a mesh and simple transformations and so can be done almost completely on the GPU. Even using a mesh can be avoided if one uses a height map à la parallax mapping to alter the texture coordinates so just one quad needs to be drawn (with a suitable fragment shader, of course). The idea is simply to have areas of images at a slope depending of how much the areas should be resized when retargeting. 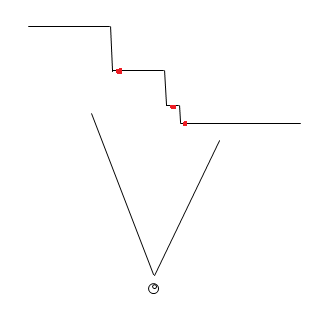 The slope angle depends of from what angle the source image is viewed to get the retargeting effect since the idea is to eliminate the viewing angle using the slope. 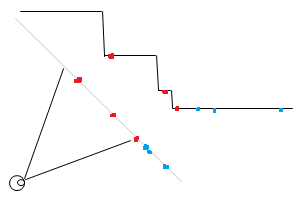 Note how the unelevated line segments will seem shorter from the viewer’s perspective while the distance between the red dots is closer to the original distance. The blue dots in the above image show how areas that have little energy and so are not on a slope, thus will be move more compared to the red dots.